"I used to visit my friend Teresa in Brownsville, TX. We would cross the border to this open air vendor/food stand to eat this. The cook did not or could not hide her ingredients, so we know what was put in this dish. You can serve this with rice, beans, or make it into wraps. The ingredients are very forgiving, so feel free to increase or decrease the amount stated." Melt the butter in a large skillet over medium heat. Add the garlic; cook and stir for about 30 seconds. Add shrimp; cook until they start to turn pink, about 3 minutes. Pour in the tequila and lime juice and season with salt and chili powder. Simmer until the liquid has evaporated, about 3 more minutes. 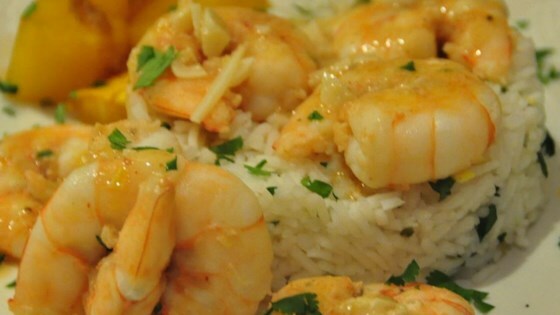 Pour shrimps on a plate and garnish with cilantro. Serve with lime wedges. Is this the easiest, most delicious shrimp recipe ever? Possibly. This recipe was excellent! I served it on top of rotini pasta and it was wonderful... had a little kick. We'll make this again and again! Delicious!!! I served with spaghetti pasta. Excellent shrimp dish!! Didn't have cilantro and replaced chili power with red pepper flakes but still came out awesome. Delicious! I followed the recipe exactly and it came out wonderful!